This is the second of a series of professional development master classes, which, are designed for those with considerable previous experience within the visual arts. Kate Downie will be leading this workshop in the depths of winter, deep in the Scottish agrarian countryside. 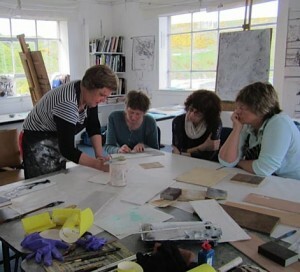 Participants will be introduced to a variety of drawing and printmaking approaches in response to the land with access to ink, organic gesso, charcoal, wood, film and acetate. Included in the workshop fee will be a mystery train journey/drawing session, and a Saturday evening lecture.